As the Legislature considers a proposal by Governor Charlie Baker to regulate ride-hailing services, advocates are calling on lawmakers to toughen the bill so it requires companies such as Uber and Lyft to accommodate wheelchair users and other riders with disabilities. The measure is meant to end a long fight over how ride-hailing services should be regulated, and it has the support of the companies. The bill only briefly addresses access for people with disabilities, however, saying the Department of Public Utilities would have the power to regulate the accessibility of the services, without listing any specific requirements. Governor Charlie Baker’s legislation would require the services to get a state license and subject drivers to background checks. The effort to add a more detailed accessibility provision got a boost Thursday, when longtime Democratic state Senator Thomas Kennedy, who has had quadriplegia since an accident at age 19, vowed to introduce a measure that would require a percentage of each company’s fleet to be accessible. A similar measure is under consideration in Connecticut, where legislators are also working on a comprehensive bill to regulate ride-hailing companies. Uber and Lyft do not offer vans that are wheelchair-accessible in the Boston area, though many of their drivers’ vehicles can fit small folding wheelchairs. Lyft’s website lists other companies that offer accessible vans; Uber recently partnered with existing taxi vans with wheelchair lifts under pilot programs in certain neighborhoods of Chicago, Houston, Philadelphia, Los Angeles, New York City, San Diego, San Francisco, and Washington, D.C.
Company officials said Uber instructs its drivers to comply with federal disability requirements and gives them tips on how to accommodate passengers with disabilities. They also said the company was exploring how it might introduce wheelchair vans in Boston. But Uber cautioned that adding such vans could be difficult, since most of its drivers use their personal vehicles and relatively few people own such vans. Other modes of transportation have their own problems with accessibility. A review in 2013 found that only one of the 100 supposedly accessible privately owned taxi vans in Boston met federal standards, and today, only 18 of the vans have been retrofitted to meet federal standards, said a spokeswoman for Mayor Martin J. Walsh. Similarly, a number of people with disabilities criticized the Massachusetts Bay Transportation Authority’s RIDE van service, saying it is ineffective and inconvenient. Ride-hailing services got mixed reviews. Some who use smaller wheelchairs said they love Uber because it affords them a higher level of independence. And riders with vision impairment praised Uber’s smartphone app, which they said works well with phones’ text-to-speech functions. But others related disconcerting experiences. Kristen Parisi, an account executive at a Boston communications firm who has used a wheelchair since she was 5, said that on two occasions Uber drivers refused to pick her up after they saw her wheelchair. The small wheelchair folds and easily fits in the compact sedan Parisi drives most days. According to Parisi, she recently summoned an Uber car to take her to Logan Airport. The driver at first said the wheelchair was too big. When Parisi explained that it would fit, the driver argued it was dirty, “like a dog,” and would ruin her car. “People in wheelchairs shouldn’t be using Uber,” the driver said, according to Parisi. Parisi said the incident was deeply upsetting because she is completely independent, professionally successful, and never thinks of herself as disabled. “It was the most dehumanizing experience,” Parisi said, choking back tears. 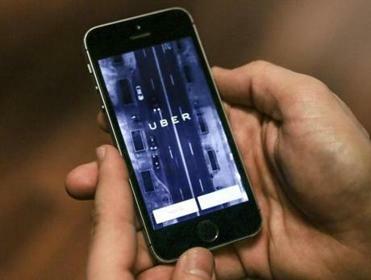 A spokesman for Uber said company policy prohibits disclosing specific disciplinary actions against drivers. However, he said, similar violations of company policy had resulted in drivers being permanently banned from the Uber platform. Told of the encounter, Thomas Kennedy became emotional. Uber Technologies Inc. and Lyft Inc. are facing lawsuits in Arizona, California, and Texas for not offering wheelchair-accessible vans or because drivers for the companies refused to pick up passengers with guide dogs. In one of the cases, Uber argued it was not a “public accommodation” and was therefore exempt from the Americans with Disabilities Act, or ADA; that federal law requires many businesses, including taxi companies, to provide equal and reasonable accommodations to disabled customers. However, the Department of Justice disagreed in a sternly worded filing, saying the company “may not contract away its ADA responsibilities” and that the law “applies to private entities that are primarily engaged in providing transportation services” — regardless of whether a company is a public accommodation.